These warehouse tags and stock control tags allow products and goods received to be clearly identified and stored within warehouses or storage units. 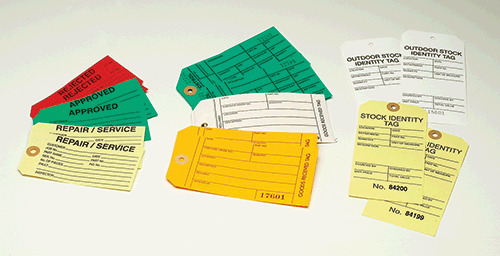 If you're looking to organise your stock, then you need some warehouse tags from Label Source! Many versions of our stock control tags have unique serial numbers (factory generated) to assist in traceability and tracking. Many warehouse tags are for indoor use only, but you can purchase an outdoor plastic stock control tag, which is waterproof and weatherproof to be used on items stored outside. All come in a convenient pack size of 100 tags. Other tags can be used for stores inspection of incoming goods, with versions available for approved, rejected and items requiring repair or servicing. These are supplied unstrung, although string and wire ties are available. Our warehouse tags come in convenience packs of 100 and though primarily used indoors, there is an outdoor warehouse tag available which is durable for all weather conditions. If you can't find the warehouse tags you need here, give one of our experts a call on 0800 3761 693 or e-mail sales@labelsource.co.uk.